More nice weather for a couple more days. The slide into Autumn is never a straight line with the path towards cold and snowy weather often taking a circuitous route accompanied with sharp rises and steep falls but the long-term trend is of course always downward. The slide into Autumn is never a straight line. The path towards cold and snowy weather often taking a circuitous route. There can be sharp rises and steep falls in temperature but the long-term trend is, of course, always downward. September finished on a warm note but then there was a dramatic cool down. The past few mornings have been quite chilly reminding us that frost and freezes are not too far away. You may think that fall is actually here and our summer weather has finally ended, but that is not actually the case. The beautiful afternoons we been experiencing in the past few days will continue for two more days. As high pressure, which has been creating all the nice weather moves south of the region, the return flow of air means some of us could see an 80 degree reading this afternoon. Eventually this fantastic weather will come to an end. Eventually it will turn cold. Eventually it will snow. We all know in the back of our minds that all this amazing sunshine and pleasantly warm air can’t stick around for another month. But it’s great while it lasts. Sunshine is nice, but rain is also nice and we do need some. Most areas finished September on a dry note and this has continued into the beginning of October. The coast remains in a full drought, with dry conditions across over 40% of the state, much of that in the more populated areas. I do see some rain in the forecast which, like our nice weather of late, will stick around for a while once it arrives later this week or over the weekend. 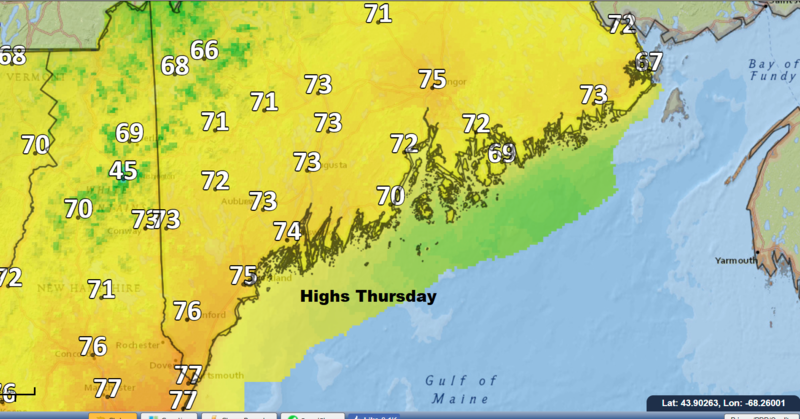 High pressure, the generally good weather system, remains in control through Thursday. At this point a cold front will pass through with the slight chance of a shower. Problems arise this weekend because the front will remain close enough to the area for the boundary of air masses it represents to fight with each other and produce a lot of clouds and some risk of showers. A low pressure system may cross New England with some much needed rain sometime Sunday or Monday. I don’t want to start predicting how much rain just yet, but it could be significant and beneficial. In addition to possible rain, the humid air to the south of the front will also return. I expect it to start feeling a bit stickier on Saturday and downright humid later Sunday. This moisture in the air will contribute to the chance of showers. The unsettled weather will continue through the holiday weekend and into early next week. Another front will pass through the region in about a week and will likely usher in the coolest air of the young fall.